1. [In capitalist society:] Property which (supposedly) belongs to the public, rather than to some private individual. In reality, in bourgeois society, public property is not really owned by the public! It is instead owned by the ruling bourgeoisie, and managed by them in their own class interests. In some cases it is to the advantage of the bourgeoisie if the use of the property is made freely available to the public (as with most roads). In some cases the property is made available to the public only for fees, which are often substantial, as with certain parks. And in other cases, so-called “public property” is restricted entirely from public use (as with the vast tracks of land reserved for military bases and other government operations, or for cheap lease to private logging companies). 2. [In socialist or communist society:] Property which truly does belong to the public, and which is managed in the actual people’s interests either directly by the people themselves or else through their representative government or agencies. Public relations is the “art” of making bad seem good or wrong seem right. It is mostly employed by the rich (who can afford to hire professional specialists to do this) in order to try to hide their misdeeds and crimes against the people, or at least to put a “positive spin” on them. “Here’s Rule No. 1 in public relations: If you do something stupid, don’t do somthing stupider to try to airbrush it. 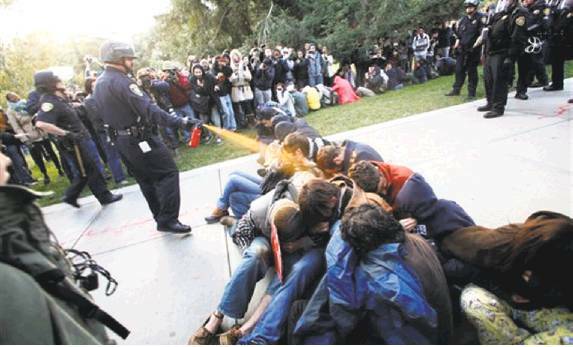 UC Davis is providing a case study in what not to do for communications classes everywhere. “A Google search offers a less glowing account. On Thursday, the keywords ‘UC Davis’ popped up links to stories about this ham-handed cover-up—with the chancellor’s picture. If UC Davis is thinking about rehiring the reputation consultants to undo this [latest] debacle, we offer this free advice: Don’t do it.” —Editorial in the San Francisco Chronicle, April 15, 2016, p. A13. The scientific theory that biological evolution over geologic time does not occur at a constant rate but rather each lineage is generally characterized by fairly long periods of relative stasis alternating with shorter periods of much more rapid change including new speciation. These periods of more rapid change are often caused by external factors such as climate and environmental changes and by mass extinctions which open up many new niches. The theory of punctuated equilibrium was first proposed by Stephen Jay Gould and Niles Eldridge in 1977. Gould’s father was a Marxist and his son learned about the Marxist philosophical principle of qualitative leaps from him. (This is part of the reason that punctuated equilibrium has often been opposed by reactionaries and anti-Marxists.) But punctuated equilibrium is also based on quite substantial paleontological evidence and is now generally considered to be a valid and important principle of evolutionary science. “But since the early 1980s, methodical paleontological research, together with much higher resolution isotopic age dating, has shown that the fossil record is not always so fatally flawed. Many alleged missing links have been found (e.g., dinosaur to bird, land mammal to whale), and it has also become clear that evolutionary rates are simply not constant. Comparatively rapid radiations—periods of branching and experimentation—have occurred many times in the geologic past, particularly after episodes of devastating environmental change and mass extinction (e.g., after the Permian-Triassic debacle and the Cretaceous-Tertiary meteorite impact). So the idea of punctuated equilibrium has been somewhat grudgingly accepted by the paleobiological community.” —Marcia Bjornerud, Reading the Rocks: The Autobiography of the Earth (2005), p. 161. Nominally independent soldiers raised and controlled by an imperialist country from the population within the oppressed country it is exploiting. All imperialist powers have done this when they’ve been able to, so as to put only the foreign population at risk instead of their own soldiers. During the 1930s and 1940s, for example, the Japanese imperialists had the slogan of “using Chinese to subdue Chinese”, a policy which included the use of puppet troops as well as other measures to divide the Chinese people. During the colonial era, puppet troops were more easily seen for what they are. But under neocolonialism the situtation is in essence the same. Local military forces under the control of the comprador bourgeoisie or other agents of foreign imperialism are directed to suppress any rebellions or revolutions, thus making it easier for the foreign imperialists to maintain real control. The traditional way to calculate the income, standard of living, or gross domestic product (GDP) in a foreign country is to take the values in the local currency and translate them into dollars via the current official exchange rate. However, this does not take into consideration the fact that prices may also be lower in that country than in the U.S. (I.e., a dollar exchanged for the local currency may buy more actual goods there than a dollar buys in the U.S.) Thus a different translation of quantities expressed in local currencies must be made in order to determine the actual equivalent standard of living, GDP, or other quantity, relative to the situation in the U.S. This is called the translation into a purchasing power parity value. The PPP conversion factor is the number of units of a country’s currency necessary to buy the same amount of goods and services in that country as a U.S. dollar would buy in the United States. As noted above, this is in general not at all the same as the exchange value of that foreign currency. 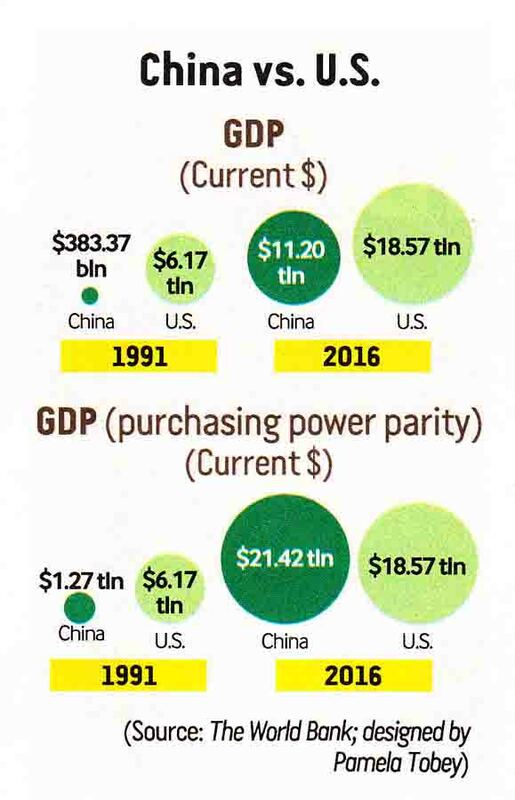 The huge difference between exchange rate comparisons and the much more accurate PPP comparisons is well illustrated in the graphic at the right, which shows that China’s GDP in 2016, instead of being smaller than that of the U.S., was actually larger. Founder of a mystical religious, philosophical idealist, and political sect in the Greek city-state of Croton (in what is now Southern Italy). He had many strange ideas, including the notion that it was wicked to eat beans. Pythagoras was also very mystical about numbers. His numerological system identified the number four with justice, and he thought that the number ten was the “most perfect number” (in part because the numbers 1 through 4 add up to 10). He is said to have proclaimed that “all is number”, after supposedly being the first to discover that musical notes are related in a simple fashion to the relative lengths of the vibrating strings that produce them. The Pythagorean Theorem in geometry is also named after him, though it was known long before his time. In ancient times Pythagoras was considered a very wise man and eventually an important philosopher (by the followers of Plato, for example). But modern scholarship has pretty much shown that this hugely exaggerates his real role in intellectual history. His followers had the habit of attributing all wisdom, including their own ideas and discoveries, to Pythagoras, in much the same way that Christians do with Jesus, and that dogmatists within what should be the revolutionary science of Marxism occasionally do with Marx, Lenin and Mao. See also below, and: Philosophical doggerel about Pythagoras. Members of the sect founded by Pythagoras (see above), and also his later followers. This peculiar sect required self-discipline, silence, and the honoring of numerous taboos—especially the strict avoidance of eating meat and beans. Pythagoras and his followers expanded the concept of the soul (which had originally only meant the physical breath that leaves the body when a person dies) into a partially mentalistic concept. However, they still also identified this “immortal” soul with gases, and seem to have believed that the eating of beans, which led to farting, allowed part of the soul to prematurely escape the body! (Religion is a very weird thing!) After a person’s death, however, they believed the soul could be reincarnated into a new body, or into other animals or plants, or to “rejoin” the universal “soul”. Politically, the Pythagoreans were a secretive, cultish faction of the slave-owning aristocracy. The idealization of mathematics was also an important part of Pythagorean doctrine. When the followers of Pythagoras discovered that the square root of 2 is an irrational number (i.e., one which cannot be expressed as a ratio of two integers), they were so upset that they tried to hide this discovery from the world. See also: Philosophical doggerel about Pythagoras and his followers. “From the observation of nature, the ancient Babylonians and Egyptians built up a body of mathematical knowledge which they used in making further observations. Thales perhaps introduced deductive methods; certainly the mathematics of the early Pythagoreans was deductive in character. The Pythagoreans and Plato [The Republic, section VII] noted that the conclusions they reached deductively agreed to a remarkable extent with the results of observation and inductive inference. Unable to account otherwise for this agreement, they were led to regard mathematics as the study of the ultimate, eternal reality, immanent in nature and the universe, rather than as a branch of logic or a tool of science and technology. An understanding of mathematical principles, they decided, must precede any valid interpretation of experience. This view is reflected in the Pythagorean dictum that all is number, and in the assertion attributed to Plato that God always plays the geometer.” —Carl B. Boyer, The History of the Calculus and Its Conceptual Development (1949), p. 1. “[T]he Pythagorean mathematical concepts, abstracted from sense impressions of nature, were now in turn projected into nature and considered to be the structural elements of the universe. Thus the Pythagoreans attempted to construct the whole heaven out of numbers, the stars being units which were material points. Later they identified the regular geometrical solids, with which they were familiar, with the different sorts of substances in nature. Geometry was regarded by them as immanent in nature, and the idealized concepts of geometry appeared to them to be realized in the material world. This confusion of the abstract and the concrete, of rational conceptions and empirical description, which was characteristic of the whole Pythagorean school and of much later thought, will be found to bear significantly on the development of the concepts of the calculus.” —Carl B. Boyer, ibid., pp. 17-18.